Bold and intense, this is a pretty easy ice cream to make. No ice cream maker needed! 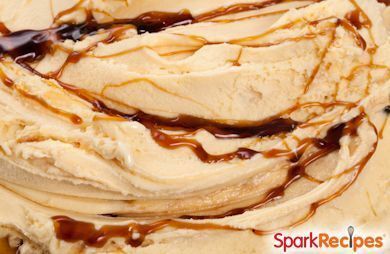 Bold and intense, this is a pretty easy ice cream to make. No ice cream maker needed! Caramelize sugar with salt in medium saucepan over medium low heat. Add 1/2 of the milk and cream mixture. Simmer over low heat stirring often for about 10 to 12 minutes. Add the rest of the cream mixture. Chill in the fridge for a bit. Or, pour mixture in a metal bowl and stick it in the freezer. Every 20 minutes, stir vigorously with a fork, whip or hand held mixer. This should have the consistency of soft serve.